“Hostages will not be recognized for bargaining purposes.”Wait, what?! I was sitting there reading the release forms and guidelines that I was asked to sign, and came across this line and at that moment, I wondered just what I had gotten myself into. You see, I had recently agreed to visit the The Last Mile’s (TLM) program at San Quentin State Prison. They teach coding skills to incarcerated individuals in an effort to help reduce recidivism. I loved the idea of their work and though, at the time I didn’t have the intention of doing that work myself, I agreed to visit the guys as a volunteer mentor. Now, after reading the guidelines and warnings, I was a little nervous about the prospect. Scratch that – I was borderline shook! Still, I made a commitment and was determined to fulfill it. I mean, it was only four hours, right? What could go possibly happen in four hours? What does it sound like when change happens? In this case, it sounded like a giant metal door slamming behind me, as we wrapped up that first visit back in April 2016. It got me reflecting on my morning. It was nothing like I expected or experienced before. The guys? They were a lot like the guys I grew up around and they had accomplished so much under circumstances I couldn’t come close to imagining. Honestly, I was blown away by them all. At the end of that first visit, a few of them asked me what I thought of it all and if I would come back. I said, “I’ll come back if you guys and TLM see value in it”. That was 14 months ago and in that time I think I may have maybe missed a handful of the biweekly mentor visits and only because I was traveling. You see what I realized that day, was that there were human beings in front of me, desperate to learn, on a difficult and amazing journey of forgiveness and redemption and I could actually help them – if only in a small way. More importantly, over the next year, I would realize just how much they could teach me in return. I am telling you all this, not to “humble brag” about all the good work I have done. No, I want to share what I learned and gained from this experience: when you start from a posture of generosity, the return on what you give is multiples of what you put out. At around the same time I was actively seeking ways to start becoming more active again working around social justice issues (something that was always important to me and that I simply “ran out of time” for over the years). My experience with TLM was profound, I was giving my time and knowledge to the guys and they were giving me something in return, they were teaching me humility, gratitude, forgiveness, generosity, steadfastness and so much more – they gave me purpose again. It wasn’t the huge change I chased (and never quite saw) when I was young, out protesting to change the world. It was small incremental changes in one person that you could see right in front of you in real time. I wanted more of this in my life and wondered if it were possible to do both things – support my family and make a positive impact in the world. I made the decision shortly after the first few visits inside that I was going to somehow merge that part of my life with my business, that what I was truly missing in my work was purpose. I also knew if I couldn’t combine them, that one would always slip for the other – for it to work it required perfect balance. I wasn’t sure what that would look like, but I knew it was what I had to do. I had learned about B Corps a few years earlier and though I loved the idea, the prospect of taking on the assessment requirements, plus the legal formation work seemed way too daunting. But after spending a few months with the guys in TLM, I redefined what was possible for myself and decided to take it on. After all, they were learning to become full stack developers without access to the internet and by writing their code in notebooks when they didn’t have access to the computer lab. They did this all the time, often not knowing when (or if) they were going to get out of prison. It put things into perspective for me and made me check myself every time I thought I was “too busy” or something was “too hard”. Without learning from their examples, I might have never gotten to this point and I am so thankful to them all for those lessons. 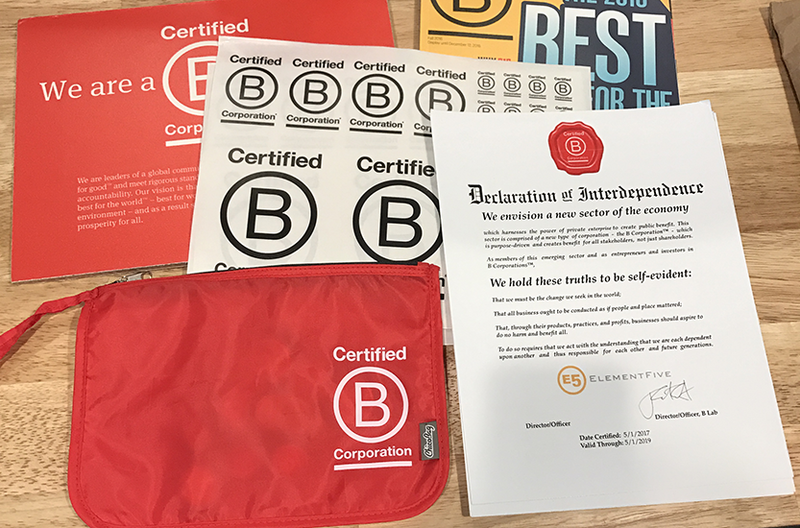 About a year later, here we are – proudly announcing that we have been certified as a B Corp. Our specific social benefit is to provide 5% of our billable hours to pro bono services and volunteer work for nonprofits working in the spaces of social justice and economic equality. One part of that for me is to teach graphic design to a small group of the guys within the TLM program. Personally, I am more in love with what I do for a living and proud of what Element Five has become than ever before. By embracing this process we not only codified our mission for working to support causes we believe in, but it made us better at what we do – raising the bar for us and our clients. As we continue down this path, we aim to keep leveling up around that purpose, but also to act as an example and guide to our peers so they can join us in this B Corp movement – you can see our official B Labs profile here. And, if you are in the Bay Area, come celebrate on June 16th, 2017 as we “Relaunch” Element Five officially as a B Corp, details are here. Congrats Dean. I was so pleased to hear about you finding the key you had been looking for. Purpose is what motivates for the long haul and the frustrating days, for me as well and Im working on that myself. Im proud of you. Thanks Alice – it means so much coming from you! Wow, Dean!! I have tears in my eyes reading this. What an epic journey. I struggle with finding time with kids, work, etc. Awesome that you made time to start the process without knowing how it would all work out. Keep up the good work! ! Thanks Brian – I truly appreciate your feedback!